Luke had his first MRI on Friday. Many people would say having an MRI is not a miracle, but let me tell you why I believe this particular one was. My twin sons were both born with congenital heart defects. Luke’s were particularly challenging and we came within inches of losing him when he was just a baby. Multiple heart surgeries were needed to allow him to grow and thrive so he could handle the next heart surgery they had planned for him. During one of the surgeries, it was decided to attach metal leads to his heart to prepare him for a pacemaker they believed he would most certainly need at some point in his life. Fast forward through other scary surgeries and situations and we get to a point in his treatment where we were told several times that an MRI would be the best way to look at his problem to develop a solution. But there was no way he could go through one of those! Not with that metal inside...an MRI uses huge industrial magnets to capture images. It would be way too dangerous to have one with metal leads on your heart. Or at least so we believed. When Luke was 13, he started developing lesions in his liver that mimicked the kinds of lesions that are associated with liver cancer. He was told by more than one set of doctors to prepare himself to be put on the list for needing a heart and liver transplant. When he was 14, Luke received a pacemaker. Recently, we were told Luke’s liver lesions started showing signs of growth again. He was told by his new doctors at Mayo that he should get a cat scan every 3-4 months to keep in eye on them. Luke was very concerned about this because he'd heard that people shouldn't have more than 20 CT Scans in their whole lives because of the radiation involved. A few weeks ago, after his latest scan was performed, the doctors felt comfortable stating the lesions on his liver weren’t cancer. We then heard a familiar phrase from the past. "It would be so nice if we could get an MRI just to be sure." We agreed. That would be incredible, but just not possible from everything we’d been told in the past 16 years. Our doctor said, let me connect with your cardiologist and see what is possible. Long story short (too late) they concluded he could safely have an MRI if they took the appropriate precautions. He’d have to have his pacemaker checked before and after the procedure and a cardiac nurse would be monitoring his status the whole time. Oh, and he’d also need a physicist in the room to constantly monitor the amount of heat being generated in his chest to make sure the heat levels weren’t getting dangerous! We were very nervous about doing the procedure, but re-assured when we arrived and they told us that the Mayo Clinic has already performed MRI's on patients with pacemakers more than 3500 times without having an issue. So we did the procedure and as they said, we had no problems. They were able to get the images and get a better look at his lesions and again conclude they are benign. In the words of Luke's cardiologist, it was a very reassuring scan. 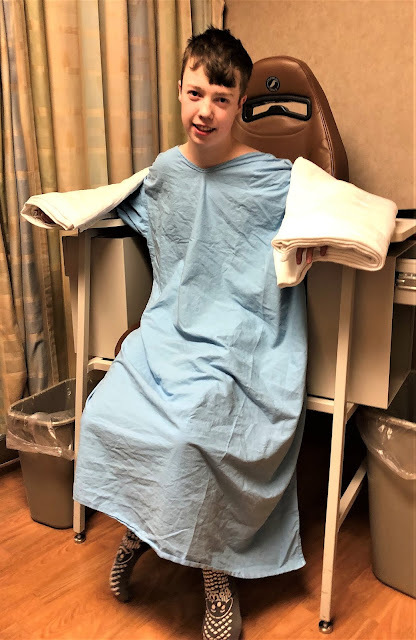 We never thought Luke would be able to get an MRI, but thanks to the miracle workers at the Mayo Clinic who are constantly pushing the boundaries of medical technology, we were able to do so. And that is why I believe that Luke's first MRI was nothing less than a miracle.